Kayak fishing is an alternative form of local fishing which numerous anglers are turning to for a more serene and intimate day on the water. With the popularity of kayak fishing increasing as steadily as gas prices, more and more people are finding themselves searching the web for kayak fishing related info. 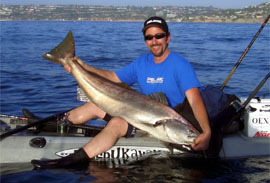 San Diego Yak Fishing has been put together to provide Southern California anglers with information and resources on local Southern California kayak fishing scene. 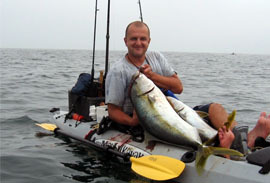 Many anglers are finding out is that kayak fishing is proving to be more effective than fishing from a motorized boat. Everything that kayak lacks in terms of speed, it more than makes up with its stealth. Being able to pull up quietly on the fish puts you at great advantage – fish are no fans of that buzz of an outboard over their heads. Kayak will allow you to fish the spots that are impossible, or not easily accessible when fishing from a power boat. If you are new to kayak fishing, you need to take your time and learn about the sport. You want to gradually work your way up – start fishing in secluded bays or lakes, and work your way up to the open ocean. Do not ever get too relaxed about your own safety! Always wear a life jacket, always carry a communication device (hand held radio, phone), have a navigation device (compass, GPS). Let your family know about the exact location you are planning to fish, and approximate time they can expect you back home. The web has plenty of information on kayak fishing. Kayak Fishing forums/bulletin boards the best place to visit. the chances are – the information you are looking for is already there – the forum search button is your friend. If unable to find what you’re looking for, post your question and other kayak anglers are known to be supportive of the newcomers to the sport; other more experienced folks will help point you in the right direction. 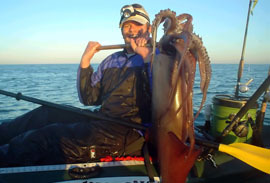 The two most popular kayak fishing forums in Southern California are www.bigwatersedge.com and www.kayak4fish.com . When it comes to accessories and necessary kayak fishing gear, you can check one of the local OEX Kayak fishing shops. 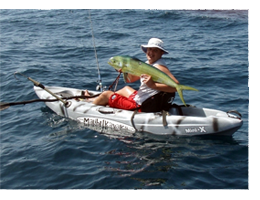 OEX has been in business of providing fishing kayaks and accessories since 1995. They have multiple stores in Southern California – check their web site for the locations – www.oexcalifornia.com. OEX offers everything you need for a successful day of kayak fishing, whether you’re a seasoned veteran stopping by to pick up a new carbon fiber paddle or a first timer looking to get completely outfitted. OEX also does custom installation and rigging of your kayak, as well as repairs. If you’d rather shop on the web, you want to check out www.kayakfishingsupplies.com. Kayak Fishing Supplies is a web extension of OEX – you’ll find all the leading kayak models and manufacturers – Hobie Kayaks, Malibu Kayaks, Ocean and Wilderness Systems. In addition, you will find a wide range of kayak fishing gear and accessories. The chances are - everything you need for a safe and successful day of kayak fishing, OEX or www.KayakFishingSupplies.com will have it. Because kayak fishing is still a growing sport a lot of anglers are still making the transition to this unique form of fishing. That is why OEX offers an Introduction to Kayak Fishing Class which consists of one classroom setting seminar in which all topics are covered, from basic paddling technique to more advanced kayak fishing methods and fish handling. The second part of the class is an instructional trip where the students will learn to surf launch, make bait and become comfortable fishing from a kayak. Who knows you might even get lucky and catch that fish of a lifetime!